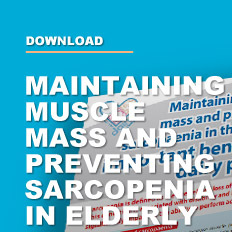 Sarcopenia is defined as the age-related loss of skeletal muscle mass and strength.This condition is associated with lower functional independence and disability that significantly impacts on the ability to perform activities of daily living and quality of life. Resistance exercise has the ability to increase muscle protein mass and strength, which over time can result in improved muscle protein synthesis and muscle hypertrophy.Preserving muscle mass has a number of benefits, including maintaining metabolic rate and thus reducing risk of obesity and its comorbidities. There is a growing body of evidence that has highlighted the potential of milk-based proteins to enhance the benefits of exercise in maintaining and enhancing muscle mass in older adults. Dairy products have a high nutrient density and palatability, making them very beneficial in the diet of both healthy and frail elderly persons. 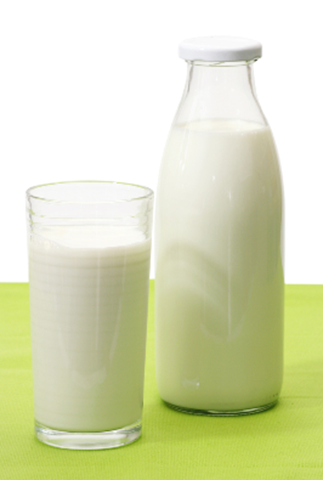 In addition, milk proteins have a high biological value and quality. Whey and casein proteins are absorbed at different rates in the digestive system. Whey protein is thought to support rapid increases in muscle protein synthesis while casein is more likely to support sustained increases in muscle protein synthesis and decreases in muscle protein breakdown. Whey proteins, also termed “fast proteins,” remain in a liquid state in the stomach, thus increasing amino acid availability and absorption. On the other hand, caseins, or “slow proteins” clot in the low pH of the stomach, resulting in a slower availability of amino acids. In addition to the whey and casein proteins that are present in dairy milk, it is also a very good source of the amino acid leucine, which is especially important in stimulating muscle protein synthesis. A study by Hartman et al. (2007) in healthy young adults, showed that the intake of milk after resistance training over 12 weeks resulted in greater increases in muscle mass than groups that were supplemented with soy. Another study by Wilkinson et al. (2007) compared the effects of skim milk and soy milk after exercise in young healthy men and found that although both foods promoted muscle mass maintenance and gains, the consumption of skim milk resulted in greater muscle protein synthesis than the soy. These researchers concluded that the consumption of milk with resistance training supports a lean muscle mass accrual. Recently Bjorkman et al. (2011) undertook a randomised cross-over trial in older persons (mean age 69.5 years) with polymyalgia rheumatica. These participants consumed regular milk or a whey protein enriched dairy product with high leucine content after exercise for eight weeks. The two products resulted in similar improvements in muscle mass and muscle function, but the whey product tended to prevent accumulation of body fat.These results were confirmed in young adults who consumed different sources of milk-based proteins. The consumption of whole milk, skim milk, and skim milk plus carbohydrate all improved muscle synthesis after resistance training. Cermak et al. (2012) conducted a meta-analysis to examine if protein supplementation augments the effects of resistance exercise in younger and older subjects. Data from six randomized clinical trials related to the impact of protein supplementation in untrained older subjects were combined. Five studies included only dairy protein (whey, milk or casein) and one included a combination of egg, meat and dairy. Although the individual studies failed to find a significant benefit of protein supplementation versus placebo on fat free mass gain, the combined data from 215 older subjects showed that protein supplementation resulted in 38% more fat free mass and a 33% increase in strength when compared to placebo. One trial involving the intake of milk-based proteins during or after exercise in the elderly has reported conflicting results. A randomized-controlled trial in healthy middle-aged and older men by Kukuljan et al. (2009) could not demonstrate any added benefits of milk consumption over that of resistance exercise training alone. In this trial, however, milk was not consumed directly after exercise, meaning that the benefit of exercise-induced blood flow and the potential of amino acids to improve muscle protein synthesis after exercise were not utilised. The authors acknowledge that the timing of milk consumption could have been the reason for the lack of impact in that trial. Milk-based proteins have biological effects that may improve the beneficial effects of exercise, since these proteins are an effective protein source for stimulating muscle protein synthesis, slowing muscle protein breakdown and improving muscle mass. 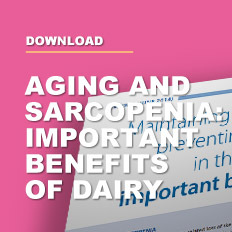 The anabolic effect of milk may be an effective, practical and cost-effective way for maintenance of muscle mass and strength in the healthy elderly and fast recovery in the frail and malnourished elderly. 1. Walston JD. 2012. Curr Opin Rheumatol., 24:623-627. 2. Phillips SM, et al. 2009. J Am Coll Nutr. 28:343-54. 3. Forbes SC, et al. 2012. Endocrine. 42:29-38. 4. Van Staveren WA and de Groot LC. 2011. J Am Coll Nutr. 30(5 Suppl 1):429S-37S. 5. Gryson C, et al. 2013. Clinical Nutrition. http://dx.doi.org/10.1016/j.clnu.2013.09.004. 6. Norton C and Jakeman P. 2013. Int J of Dairy Technology. 66(3):317-320. 7. HartmanJW ,et al. 2007. Am J Clin Nutr. 86:373-381. 8. Wilkinson SB, et al. 2007. Am J Clin Nutr. 85:1031-40. 9. Bjorkman MP, et al. 2011. J Nutr Health Aging. 15:462-7. 10. Elliot TA, et al. 2006. Med Sci Sports Exerc. 38:667-674. 11. Cermak NM, et al. 2012. Am J Clin Nutr. 96: 1454-1464. 12. Kukuljan S, et al. 2009. J Appl Physiol. 107:1864-1873.